Cranes were used to move and remove equipment over the process of updating the outdated HVAC systems in this North Texas food processing facility’s retrofit. A food manufacturer and distributor located in North Texas has sated its need for improved working conditions and operational efficiency after undergoing an HVAC retrofit to replace its well-aged facility equipment. Past its useful service life, most of this equipment was in desperate need of repairs. The project was planned with an eye to minimizing such disruptions, primarily by managing necessary facility shutdowns. Most of these were limited to weekends, with any further shutdowns set for a pre-scheduled, three-day window. A total of five cranes were also utilized during this project to great effect. 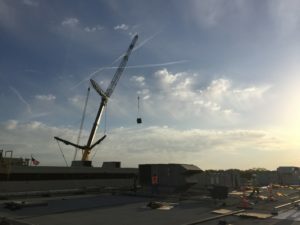 These were employed to remove 18 old units, add 16 new ones, and ultimately lift more than 113,398 kg (250,000 lb) of equipment—1100 tons of which was air-conditioning equipment bound for the roof. Throughout the project, the crane made more than 50 swings, including both curbs and two-piece units. The retrofit focused primarily on two areas of the facility: the processing area (where chilled water [CHW] units were installed) and the packaging area (where direct expansion [DX] units were used). CHW units use chilled water to cool air, while DX units use vapor. The CHW units were supported by newly installed piping (for condenser water, natural gas, and the chilled water itself), while new supply and return air ductwork was placed to facilitate the DX units. Other supporting components, such as exhaust fans and electrical upgrades, were also implemented. It took the team seven months or 42,000 working hours to complete this $7.1-million project.